International actress, Christiane Seidel turned heads when she arrived at the Emmy Awards in her gorgeous red gown, many guests doing a double take because she resembled the likes of Amy Adams. Christiane appeared in Netflix’s Godless, Boardwalk Empire, Law & Order: Special Victims Unit, and most recently you can catch her as Hannah on FX’s Fosse/Verdon. 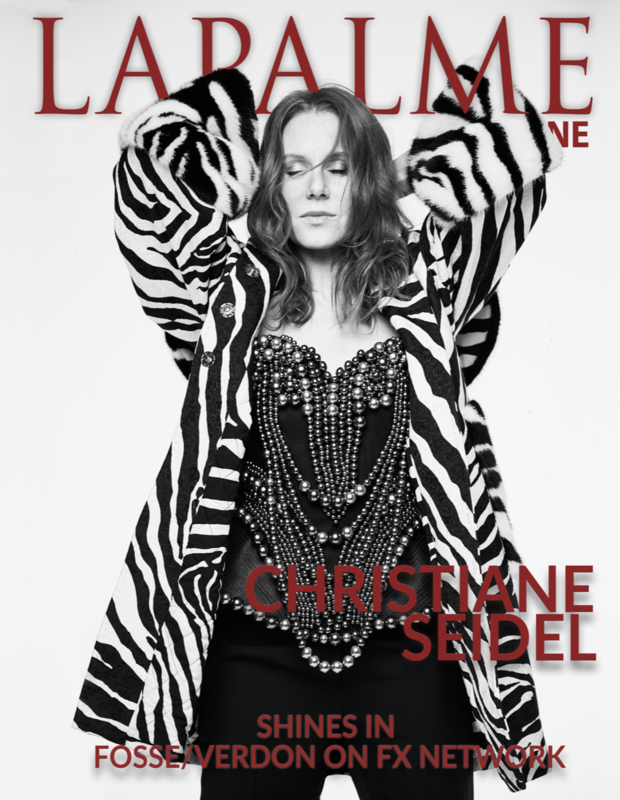 Sitting down with LaPalme, Christiane gave insight on her character, Bob Fosse and motherhood. You were on four seasons of Boardwalk Empire, set in the 20s. Then came the Western Godless, and now you’re in the new series Fosse/Verdon. Do you specifically seek out period pieces or do they find you? Period pieces might be something that I’m attracting since I love the genre. But they seem to find me. (Maybe I’m putting it out there subconsciously). I can get lost in researching specific time periods. The costumes, hair, and makeup are so transformative. It makes me feel like I belong in that era. On Fosse/Verdon you guest star as Bob Fosse’s mistress, do we get to see you dance? I’m probably one of the few actors that don’t dance on the show (which is perhaps better for everyone.) My character, Hannah, is neither a dancer nor in show business. But through her job, she witnesses the making and filming of Cabaret, which is an incredible privilege for her and me as the actor. It’s jaw-dropping! How is Hannah’s relationship with Bob? How did you feel playing “the other woman” role? Hannah meets Bob on set while he’s directing Cabaret in Munich. He seduces her with his immense charm, charisma, and power. She easily falls for him, and they have an affair, one of many throughout his life. Gwen Verdon said, “Bob grew up around strip clubs. Women were his hobby. He’d even cheat on his mistress. Part of him felt guilty, and another part was ecstatic.” As an actress, I never judge the character I play, even if it’s very difficult. My job is to justify a character’s actions and understand what motivates her. In general, we as people don’t prejudge our actions even if we realize later and regret what we did. What can we expect from this series, is it heavily biographical? The series is based on the book Fosse by Sam Wasson. And Nicole Fosse, Fosse and Verdon’s daughter, is also a co-executive producer and gave the creators access to her archives and most intimate memories. I had the privilege to meet Nicole Fosse and share a few wonderful conversations. For those who are unfamiliar with Bob Fosse and his work what is going to draw them into this series? If anything, it would be the amazing cast starting with Oscar winner Sam Rockwell as Bob Fosse, and four-time Oscar nominee Michelle Williams as his creative partner and wife, Gwen Verdon. There’s also the incredible team behind Hamilton who is producing, directing and choreographing Fosse/Verdon. What an honor and pleasure it was being directed by Thomas Kail, the director of Hamilton. Bob Fosse was a legendary choreographer and director, who won an Oscar for Cabaret starring Liza Minnelli, over The Godfather, and accumulated eight Tony awards and three Emmys throughout his career. That said, this series is as much about Gwen Verdon, who has previously been overlooked when it came to Fosse’s legacy. She is the biggest Broadway dancer of all time and is the one who made Fosse a star by shaping and molding his style and vision. What I love is that Fosse/Verdon isn’t just another story about a successful man who was considered a genius. It’s an exciting and timely show that also showcases a woman’s brilliance and gives her as much credit for what he has accomplished. 2019 should have a few exciting things coming up for me. I’m not allowed to dish on all of them yet. But one project will bring me to Germany, which I can’t wait for. I was raised in Germany and my parents and old friends are there. I’m in discussions for a feature film that’s part of a trilogy shooting in New York with a director I’ve worked with in the past. My theatre company (Scandinavian American Theater Company) will be heading to Hong Kong in the fall to participate in an international theatre festival. I also began directing theatre which was something I always wanted to do but was too afraid of. I absolutely love it and will definitely be doing more. Lastly, I’m in development for my first story for the screen based on my family’s history that is both tragic and inspiring. It is a huge passion project of mine and I’m really excited about producing. So many! On stage, definitely Hedda Gabler and Lady M. On screen, a mix of Claire Underwood in House of Cards and the physicality of Uma Thurman’s character in Kill Bill Vol. 1 & 2 and Charlize Theron’s Imperator Furiosa in Mad Max: Fury Road. While I was shooting Godless, I got a taste of what it meant to do stunts like riding horses western style and twirling heavy iron six-shooters. It was magical! What shows are you binging right now? I have so little time to binge since I have two-year-old twin boys who keep me insanely busy. The moment they sleep I’m usually prepping auditions or catching up on emails. But I recently caught up on The Handmaid’s Tale and started Succession on HBO. That said, I’ll be dutifully watching Game of Thrones. We heard you were pregnant with twins when you were shooting Godless. How do you balance life as a mom and your career? Raising toddler twins is unlike anything. It’s amazing, crazy, fun and hard. We have fraternal twins and of course, their needs, either the same or the opposite, are always the first priority (like just now I had to get up and hold one of my crying twins trying to fall asleep.) “Mom guilt” is a real thing when I’m not by their side. And finding any sort of balance would simply not be possible without my husband, who is just as involved and present as I am, and at the same time fully supportive of my career. We have a part-time nanny, who thankfully is flexible enough to jump in when our schedules get erratic. Some days are smooth. Other days I’m spread thin, sleep deprived, running behind, and going nowhere and everywhere at once. The good thing is how I’ve become way more efficient. And I’ve learned to say “no” to a lot of things, which is super empowering by the way. I’ve also learned, still learning actually, to let go of my perfectionism which is also freeing. And as a result, my work as an actor is better with less time to overthink things. It sounds cheesy, but I’ve really come to understand that I’m a better actor when I’m fulfilled as a mother than with short-lived or superficial things before my babies. And vice versa – I’m also a better mother when I’m fulfilled as an actor. How do you stay fashionable with kids? When I’m with my kids, I need to be super practical about what I’m wearing. We are often in the park or playground, and somehow I end up getting dirty, too. But I don’t feel good or enjoy wearing old clothes or sweatpants or pilling on sweaters. I still want to feel put together. For me, it’s all about minimalist comfort mixed with some street style, similar to the fashion you’d find in Denmark. Now I have a bunch of staples in my closet that I can dress up or down with. I can still be comfortable on the playground, and I switch to heels for dinner with the same items. When I need to step it up for events, I rely heavily on fabulously fashionable friends. For red carpets and premieres, I’ll sometimes work with a stylist and/or my publicist which is how I’ve discovered designers that work really well for my body like Marc Bouwer, Theia, Nicole Miller or Badgley Mischka. Sometimes I can’t believe what a stunning dress can do to my confidence after feeling completely outside myself and not so pretty after a long night of interrupted sleep.